Caley Thistle chairman Graham Rae. Danny MacDonald, formerly the club’s academy director, resigned from his post on Wednesday, the latest in a series of exits from the club’s backroom team. It follows chief executive officer Yvonne Crook leaving the club, as well as long-serving youth coach Ronnie Duncan retiring, stadium manager Andy Johnstone and head of finance Evelyn Brown stepping down and child protection officer Graeme Cooper, youth coach Daniel Lamond and community coach Callum Ferguson cutting ties with the club. Head of youth development Charlie Christie has been ushered into MacDonald’s role on an interim basis and the board will decide whether permanent replacements for his and Crook’s positions will be hired. 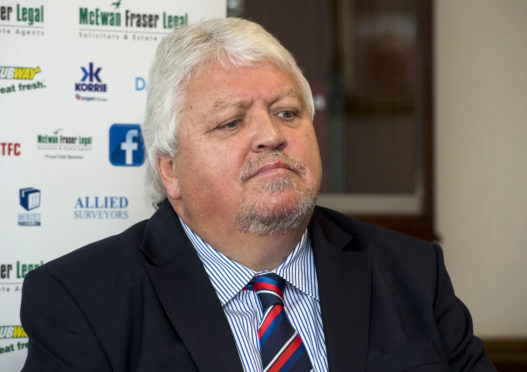 Rae, who was re-elected as chairman at the club’s AGM on March 18, moved to quell discussion of unrest in the Caley Jags’ ranks. He said: “We’ve had people taking up new jobs, moving to America and Canada and retiring and adding things up, it suggests there’s disquiet when in reality people come and go. We’ve had 55 different directors, 10 managers, more than 250 players; that’s just the way football is. MacDonald was in his second spell with Caley Thistle, having been head of youth development until the club’s relegation in 2009. He returned under previous chairman Kenny Cameron during the 2015-16 as a development executive before being promoted to chief operating officer in 2017. He later fulfilled the academy director role following the advent of Project Brave.